Madisyn Beach shows her Grand Champion Steer at the Channelview ISD Livestock Show at the Allen Hall Fairgrounds on April 11. Beach’s steer sold for $6,000. 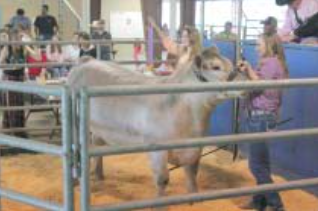 The bids were going fast and furious between prospective buyers and students proudly showed their animals as the auction highlighted the conclusion of the 52nd annual Channelview ISD Livestock Show on Saturday, April 11. As of press time, funds raised from the livestock sales were still being totaled. Funds from the event go toward the Channelview FFA Scholarship Fund. The week-long event featured many livestock, horticulture and craft exhibits. In addition, the annual parade took place before the auction with the route traveling between Schochler Elementary and Channelview High School. Longtime FFA supporters and livestock show buyers Walter and Martha Tutor served as Grand Marshalls of the parade. Of particular interest was the bidding for Madisyn Beach’s Grand Champion Steer, which earned $6,000 with Tutor Security’s winning bid. Alexis Brown’s Reserve Champion Steer also brought in quite a payday, as it was purchased by Tubular Services for $6,500.